This week instead of my sharing something I have made, I have chosen 3 blogs from last weeks Wordless Wednesday to highlight! Marvelous Mommy Next is another outing and was for mom and daughter as a get a way to Florida for a gathering with 6 other bloggers, what fun, I would love to meet up with a bunch of blogger friend and hangout for the weekend, especially at the beach! What a fun place to stay!! Julies Lifestyle And the last feature comes from Julies Lifestyle Blog where while stuck in traffic she capture a photo of the Freedom Tower,how can we forget those people that lost their lives and all that were effected by 9-11. This picture has made me think that we never know when something so horrific change so many lives. For all of the features above you can click on the photo or the link, if you would like to read their full post and say hello. Oh! 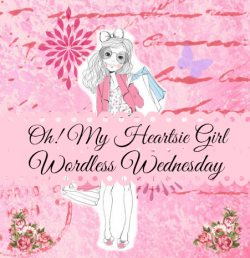 My Heartsie Girl links up each week with these great blogs and hope that you will too, have some fun, find new recipes, projects and crafts, stories about their furry friends, or great photos, there is so much inspiration I find from other bloggers as yourself, I love it! And Thank “you” for stopping by! When I visit your blog I make every effort and take time to make sure and follow your social media links such as Twitter, Facebook page, Pinterest and G+ and so, this week, I am asking that you help me to build my social following as well, I would very much appreciate it. Comments are very appreciated and I respond to everyone!! oh thank you for the feature! you are so sweet! Tried to link up but is saying not open for another 9 hours. Will try and pop back tomorrow and link up. I know, didint realize I had not set the time to correlate with my post. I have added you to the Linky manually so your in it, wahoo. Thanks for stopping by! Thank you so much for featuring me and my daughter today! I will be back later to link up my WW post! So glad to do the feature, it was my pleasure. You are welcome for the feature, it was my pleasure. I have enjoyed reading about your trip!! What a fun post. It’s always fun to see what other blogging buddies are doing. Thanks for stopping by today I always appreciate your quick visits!! Wish I could link up this week. Says it’s closed already. Great photos!! Wendy I have you all taken care of. I added you link after I resolved a little problem. Thanks for stopping by! Hi Karen, It’s nice to check out these other blogs that you featured! I wanted to link up too…..next week maybe? 🙂 Have a great week. Hi Kristi, thanks for stopping by, Im sorry the Linky was closed, I didnt realize that when I chose limit 2 links that meant after there were 2 links it would close, I thought it was to limit bloggers to 2 links, duh me. But not to worry, I have added your post to the Linky and so you will be seen. How sweet to feature other bloggers. Thank you Alissa, I think I should do this every week. Thanks for coming by, I appreciate your kind comment!!! Thank you for stopping by. I always enjoy visiting your blog as well. Awww I love the mother/daughter dresses! Too cute! I have your button on my WW page/linky now. It really brightens up my page! 🙂 Have a great day & thanks for sharing your wonderful pics! Thank you for adding my button to your blog, I appreciate it!! And for linking up this week!! Thank you for stopping to link up, I appreciate each of your visits!! Thank you Merlinda, for stopping by and linking up!! I love that you highlighted blogs from your link up! Very nice! I love checking out new blogs as well. Thank you for the link up and for sharing some new blogs! Have a great Wednesday! Good shares all — a nice way to spend your WW! Enjoy your Wednesday! Nice pictures , full of beauty , wonderful portrait with pet! Thanks so much for the invite! I just linked up! Hi Jay, Lol, I just thought it would be nice to focus on others. Always nice to have you visit! Hi Karren, wow what a surprise to see that I’m featured on your blog today. Sorry so late but I was out all day long. Thank you so much, you made my day! Enjoy the rest of the week and Happy Memorial Day weekend. your blog linky party looks like fun. I’ll be back soon to participate. thanks for stopping by and leaving a comment today! Hi there, thanks for coming by to link up, I so enjoyed reading about the quackers, I keep looking for our neighborhood pair of Mallards. I so enjoyed helping them get a good start. Wishing you a great safe Memorial Day Weekend! Thank you so much for linking up to my party and for the invitation… I hope you will join me again next week. Thank you Marly for coming by after my visit, I appreciate that and your kind comment!! I will definitely come by next week, and so I dont forget, I am adding you to my WW linky list!! Have a Safe memorial Day Weekend!! will have to check out all the posts this week. Thanks so much for stopping by, I loved seeing your trip to San Diego, road trips are always fun!! Please come back soon! Have safe Memorial Day Weekend!! Thank-you so much for visiting my blog and helping me find your WW. Good morning Joy, I am so glad you took me up on my invite and topped by. I loved your road trip, it was great seeing the back roads of Georgia!! Hope to see you again soon. Have a safe Memorial Day Weekend! What a nice thing to do to feature bloggers on WW! This is an excellent way to meet new people. Thanks for visiting. Hi Cathy, thank you for coming by, I also like meeting new people to become acquainted with. I have added your Thursday post to my linky list to remind me to visit!! Wishing you a safe Memorial Day Weekend! !